Your tour will start riding an open-air gondola from the ground to the highest point of the mountain navigating over the forest, exploring and discovering amazing views of the forest, Arenal Volcano, Lake and much more. From the top of the mountain, you will start riding down a unique zipline circuit that stretches across canyons, going from one mountain to another, and in between treetops. It truly is an exhilarating adventure of zip lining down the mountains. You’ll ride 7 cables that go up to 200m (656ft) in height and 750m (2460ft) in length where you will be astounded by its impressive heights, speeds that go up to 70km/h (43.5mph), and views, like in no other place. Sky Walk offers a more peaceful introduction to exploring Arenal Rain Forest on a 4km (2.5mi) trail that serpents through distinct levels of a wonderful diverse ecosystem. It combines a series of suspension bridges for a one on one experience with the flora and fauna of the forest canopy. You will hike deep into these magical tropical forests to admire nature from a distinct perspective. 7 ziplines, 4 hanging bridges and tramway over the forest. Unmatched views of the Arenal Volcano, Lake, Forests and more. Astounding ziplines that go up to 200m (656ft) in height and 750m (2460ft) in length and impressive speeds that go up to 70km/h (43.5mph). 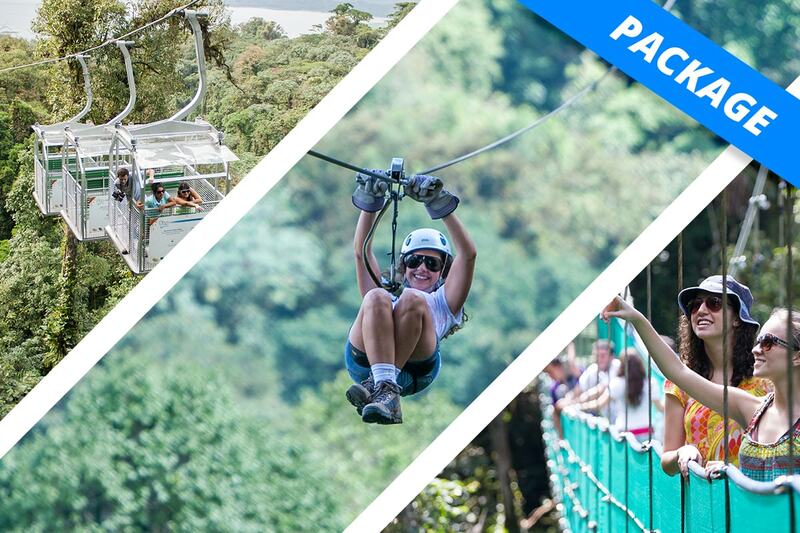 Mountain to mountain and canyon crossing ziplines. Professional certified braking systems on ziplines, with a main system and a backup one. No hands on cable (always on pulley). Person does not need to break on ziplines. Discover 2 waterfalls and exclusive breathtaking viewpoints of the Arenal lake and surroundings on our hanging bridges and trails walk.